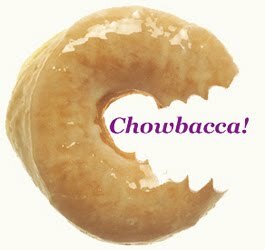 Chowbacca! mourns the loss of Jim Barrett, the vintner whose Chateau Montelena 1973 Chardonnay won first place in the Paris Judgement of 1976 - the first time any American made wine bested the French counterparts. This happened not just once during that fateful contest but twice, with Stag's Leap Cabernet Sauvignon (1973) also taking top honors. The wine world was turned on its head, and the French were predictably indignant. Subsequently, year after year American- (and particularly Californian-) made wines took top or near top honors in one blind tasting after the next. A new era in winemaking was upon us, France's hegemony shattered. To commemorate this event, I volunteered to buy a bottle of wine for our "cocktails on a bus" - and to get no less than "a $15 bottle of Ravenswood." Ravenswood being one of those dear-to-my-heart low-cost favorites of my misspent youth. Over time, however, the brand has lost some of it's former glory - demand, production cost and finally absorption into a larger wine conglomerate sealing the deal. Still, I figured I could probably do a little better* - and for that I would have to find one of the many chic food markets that dot the San Francisco landscape and suss out something a little more special (but not much more expensive). * I ended up with a 2010 Bogle Petite Syrah, which is about the same price (but better, in my opinion). I was also in the market (see what I did there?) for some comforting food, but not the usual drab starchy mess one associates with the genre (pot pie, chicken and dumplings, matzo ball soup, borscht) but something with a bit more of a kick. Something to liven the party. The origins of the dish named "pasta puttanesca" are so shrouded in winking and nudging embellishments that even most cooks can't resist having a bit of fun with the backstory (eg, Mario Batali). Is it a dish made with savory garlic fried in oil flavored with chiles and anchovies in order to entice passers-by to stop at a bordello? Is it simply a dish made of humble ingredients one might find in the pantry of a whore house? We suspect that the sauce, made with typical Roman pantry items, is more marketing slight of hand than grounded in real history. One thing is true, however, that items such as anchovies, capers, dry cured olives and dried chile flakes were considered humble in mid-20th Century Lazio, as they are today. What is ironic is that many of these items are sold at high mark-up at gourmet boutiques like the 26th and Guerrero Market in San Francisco's Mission: "imported" anchovies, packed in olive oil; "imported" Italian olives; capers, organic spices, "00" semolina flour dried pasta - hand made! - and on and on. Of course, most of these are available locally sourced (and think about it - the tomatoes grown in the shadow of Vesuvius have only done so for 500 years, and so who knows from tomatoes? Italy? Give me a break!). For the sake of time and convenience, I opted to pay a little extra - a guilty penance much like one who would engage the services of a "professional"? Perhaps. 1 28oz can of stewed, peeled tomatoes. 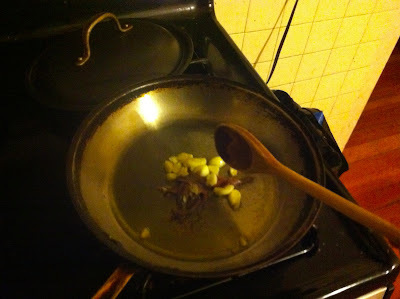 5-6 cloves of garlic, crushed with the broad side of a knife. 12-16 black dry oil cured olives (I prefer to leave the pits in to flavor the sauce), smashed with the broad side of a knife. 3 tablespoons capers (if salt packed, rinsed). 2 teaspoons of chile flakes. 1 3 ounce can of anchovies. Splash of beer or drinkable, but cheap wine. Moments before beginning this sauce, plunge an entire package of spaghetti into rapidly boiling, salted water. This recipe if for family dinner, so plan accordingly (use a #9 lodge or 12" sautée pan for the sauce). This recipe also calls for a wooden spoon. In a large skillet over medium-high heat toast chiles in extra virgin olive oil for a few seconds and, moving off the heat, add garlic and anchovies. When the garlic begins to brown slightly around the edges and the anchovies have dissolved, introduce the tomatoes, which you have crushed with your bare hands like a man (or a woman)! Let this simmer for 4 or 5 minutes then introduce the olives and capers. Return to high heat and let the sauce "tighten up". Add the beer or wine, about an ounce or two ("just a splash"). Using kitchen tongs, transfer al dente pasta from the boiling water to the sauce pan and toss, adding pasta water if needed. The pasta should be dressed like a salad. I like a nice pecorino grated over my puttanesca but you can gild the lily with the "undisputed king of all cheeses" Parmigiano Reggiano and a couple nice glugs of uncooked extra virgin. A dish, eh? The oldest profession usually gets the fork and never gets a spoon. Hey-o!